Posted: April 19, 2018 in Features, Who,What,Where & When...? Tom Sulman was born in Sydney on 25 December 1899 and died in a tragic accident at Mount Panorama, Bathurst on 30 March 1970 aboard one of his Lotus 11 Climax’. He was the grand old, gently spoken man of Australian motor racing- a racer to the core, he competed all of his life inclusive of elite levels internationally. Like most of my articles this one was stimulated by finding some photographs, and as is usually the case, doing so whilst looking for something else! 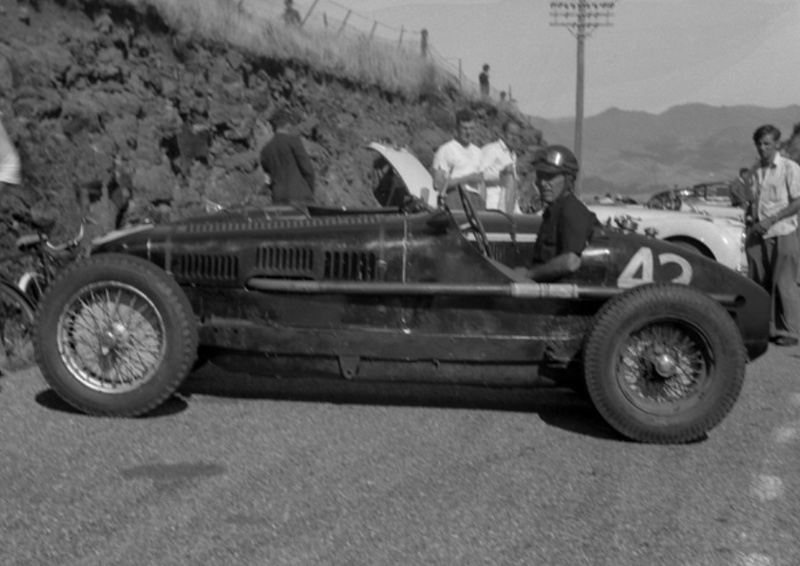 The shots of Tom and his Maserati 4CM in New Zealand in 1951 were simply too good- so evocative of the period not to do something with. The trouble is that his racing career was so long it’s a huge job to do it justice especially with information not readily available, so treat this as summary of his wonderful life with a bit of focus on the Maser, itself a car with an interesting provenance. Sulman was the son of UK born and later immensely prominent and influential Sydney architect Sir John Sulman. Tom grew up in a rambling home at Turramurra, on Sydney’s upper North Shore. Unlike his formidable father, whose competitive spirit he undoubtedly had, he commenced a career in automotive engineering, very much an industry of growth at the time. In 1923 he built his first racer, the ‘Sulman Simplex’, a road-going cyclecar, which he raced at Sydney’s Victoria Park that year. During the 1930’s depression Tom travelled to England looking for work and soon established a motor engineering business. 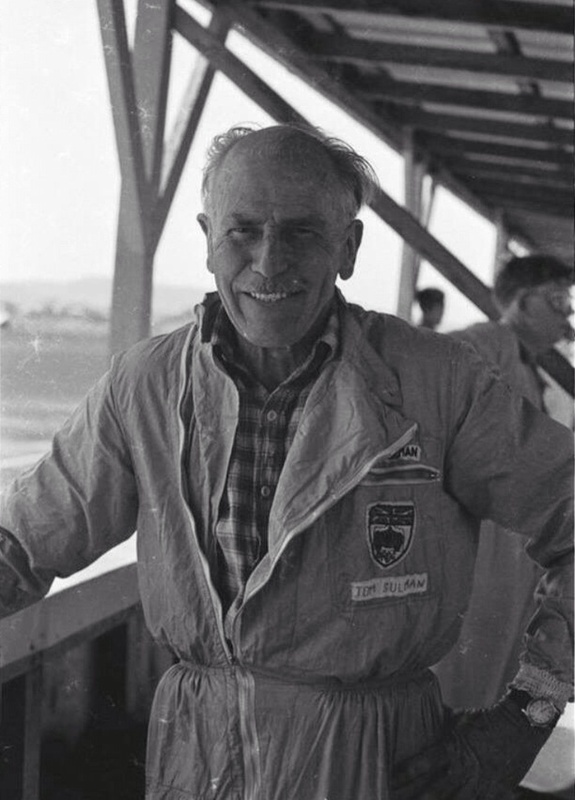 His early motor sport endeavours began in 1931 and involved conversion of a Morgan 3 wheeler to a 4 wheeler! so that he could race ‘a car’ on dirt, which was very popular at the time. Later he built a car with a motor-cycle twin-cylinder engine and a ‘vaguely Salmson chassis’ which he raced at the early Crystal Palace meetings and at Greenford. In fact Tom was right there at the start of organised car-only dirt track racing on motorcycle speedway lines. Outside the reach of the RAC, the first UK race of this type was held on Good Friday 30 March 1934, at Crystal Palace. There were three teams of three riders and a reserve with ‘New South Wales Champion’ Tommy Sulman captaining the Wimbledon Park team driving a ‘Bitza Special’! During this period he raced at tracks such as Greenford, Crystal Palace, Hackney, Lea Bridge and Wimbledon. To provide some sense of the scale and level of interest in speedway racing at the time there were over 25 tracks in the London extended area alone. In addition to his motor engineering Tom was a professional driver earning money from his race competition. He was approached by a Singer agent off the back of his performances and growing reputation to build a similar sprint and hillclimb special to his own car using Singer components. Core mechanicals were a Singer Le Mans engine and G.N. chain transmission. When the car was completed, it became the ‘Sulman Singer Special’ after the Singer agent went ‘bust’ leaving Sulman with the car! It soon became clear after the commencement of dirt track racing that the cut down sportscars predominantly used were unsuited to the tight, deep cindered UK tracks with short straights. Tom built the Sulman Singer as a dual purpose machine, but its very short wheelbase was a function of the development work by trial and error he and other leading racers had done to create a car ideal for the dirt. 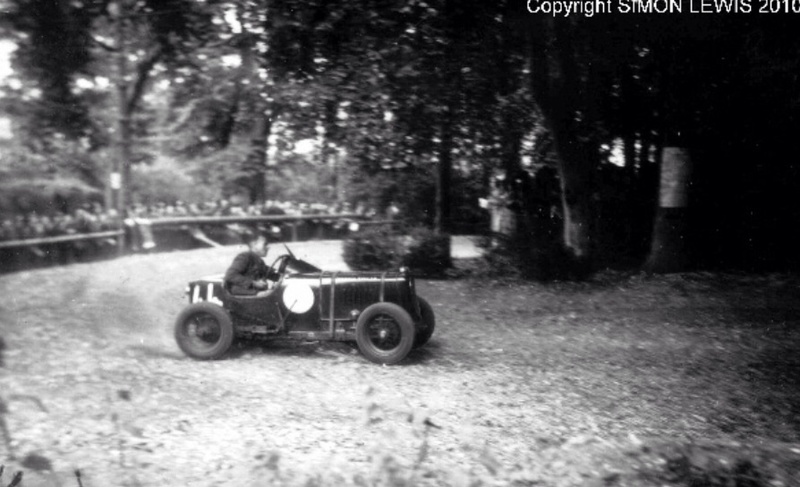 Sulman raced it regularly in the UK and once in Holland in 1936. On 4 August 1936 Tom contested the very first Midget World Championships at Hackney, in inner London. The winner with 7 points from his heats was Cordy Milne of the US- Tom was 6th with 3 points, he was 3rd, 2nd, and 2nd in his three heats. Another Australian, Dicky Case was 2nd with 6 points. An interesting sidebar is that Case, a star motorcycle solo-rider was invited into the competition as a fill-in driver due to a lack competitors- and came close to winning the thing! The program does not disclose the chassis the various competitors used. Into 1937 the Sulman became obsolete, along with most of the rest of the fields with the advent of the ‘Skirrow Specials’. These revolutionary cars built by Harry Skirrow in Cumbria had chain drive to both front and rear axles harnessing the 80bhp produced by their bespoke 990cc twin-cylinder JAP engines rather effectively. 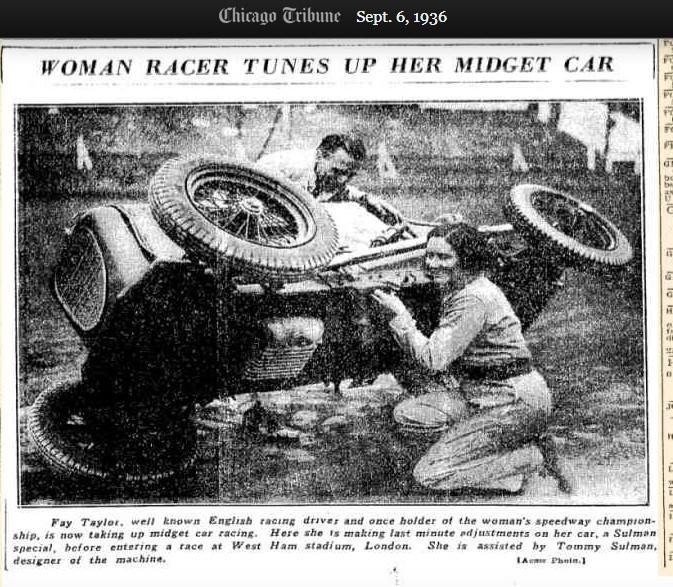 As a consequence, Tom built a 4WD car of his own in an attempt to more effectively compete- he crashed badly at Coventry in August/September 1937 and elected then to end his midget racing career. The Sulman Singer, which had been put to one side, was then pressed back into service, Tom raced it at various hillclimbs. At the end of World War 2 Sulman returned to Australia by signing on as a flight engineer on an aircraft, his very cost-effective way to take the long, expensive 12000 mile journey home was as a crew member of a Lancaster Bomber converted to carry people rather than a lethal payload. The Sulman Singer followed by ship, the car travelled sans bodywork to avoid import duty being imposed upon it by the Fiscal Fiend- the Australian Taxation Office! Tom first raced the car in Australia at Nowra on the NSW south coast in June 1947, the combination took a win in the under 1100cc scratch race. As a road racer it competed in contemporary events up to and including the Australian Grand Prix, then a handicap event. 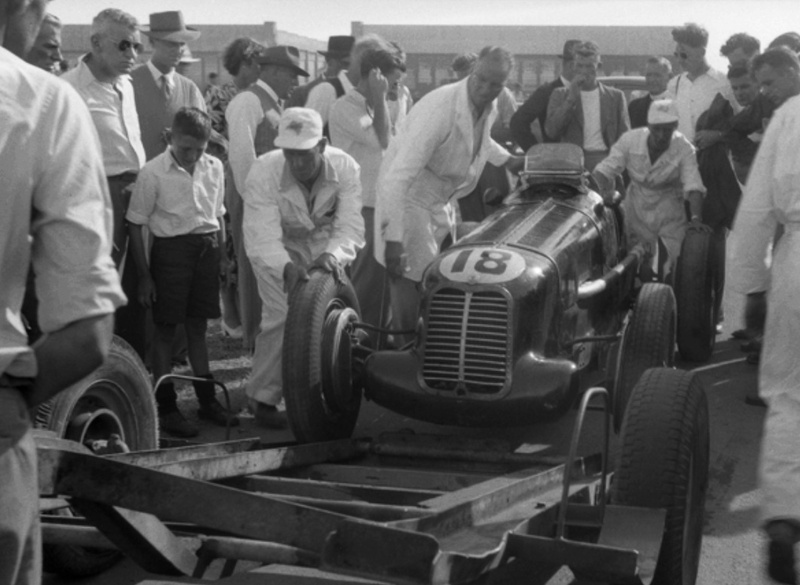 He was 5th at Bathurst in 1947 and also contested the 1948 AGP race at Point Cook in Melbourne’s outer west, the little car succumbing to the extreme March summer heat like so many others on that day. 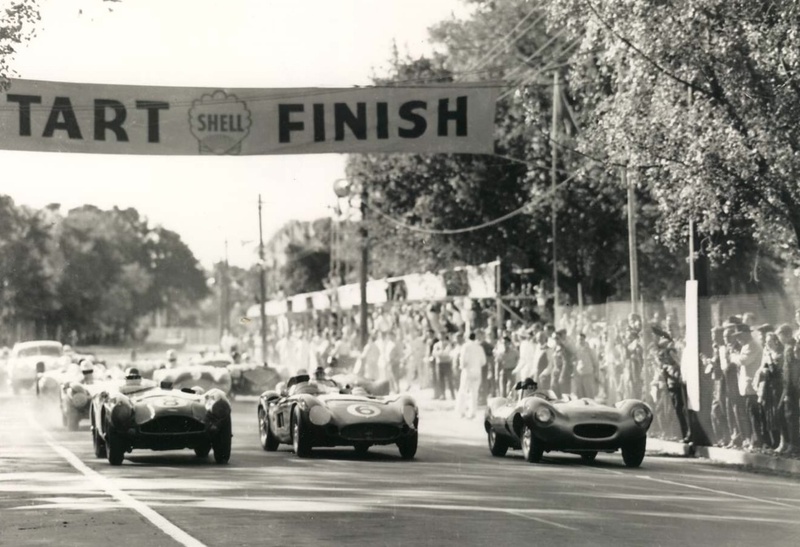 Sulman eventually sold the car when he acquired the Maserati, it raced regularly in various hands in the 1950’s but by the 1960’s was mainly used in historic events. The car was sold to AP North, then later to Monty South and finally Ron Reid on 6 November 1965 to start a long relationship of sympatico between driver and owner. Moustachioed Ron Reid, red ‘kerchief flapping in the breeze with a big smile upon his face was an icon of Australian Historic Racing in the car which still races, after Ron’s demise in 1999, in the hands of Mal Reid, Rons son. Whenever I see this wonderful machine in the paddock it always brings a smile to my face. Drivers and cars come and go, but the Sulman Singer remains a constant in Australian motor racing and would be a finalist for the ‘longest continuously raced’ car on the planet. Sulman competed in other cars as well though, including an 1100cc HRG sports car. By the late 1950’s, Tom, who had a workshop in the now very trendy inner-Sydney suburb of Surry Hills, had added to his stable the Maserati 4CM. This ex-Farina/Salvadori car, he bought from Australian resident Englishman David Chambers. Chassis # 1521, one of about twelve 1500cc 4CM’s, was first delivered to none other than Giuseppe Farina in August 1934, he won Voiturette races in it at Biella and Masaryk and then Modena and Turin. Gino Rovere, who probably owned the car when raced by Farina, raced it during 1935 and perhaps also Gigi Villoresi as part of Rovere’s ‘Scuderia Subalpina’. It then passed into the hands of several UK drivers including EK Rayson, Charles Mortimer and then formed an important part of the nascent racing career of Roy Salvadori post-war. 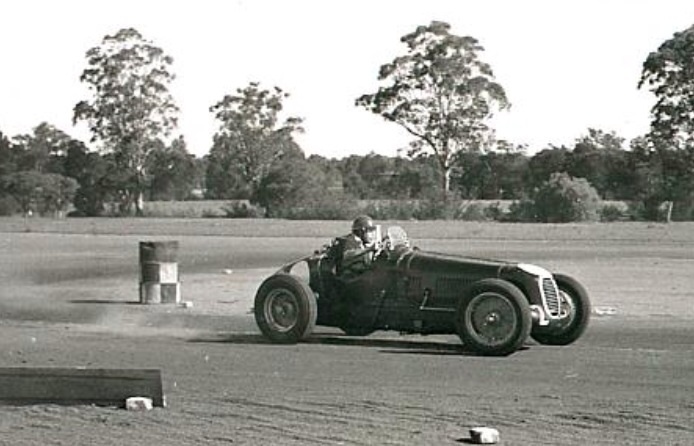 David Chambers acquired the car in England in 1949, raced it at Goodwood and then shipped it home and made his Australian debut at Rob Roy Hillclimb in outer Melbourne in 1950. 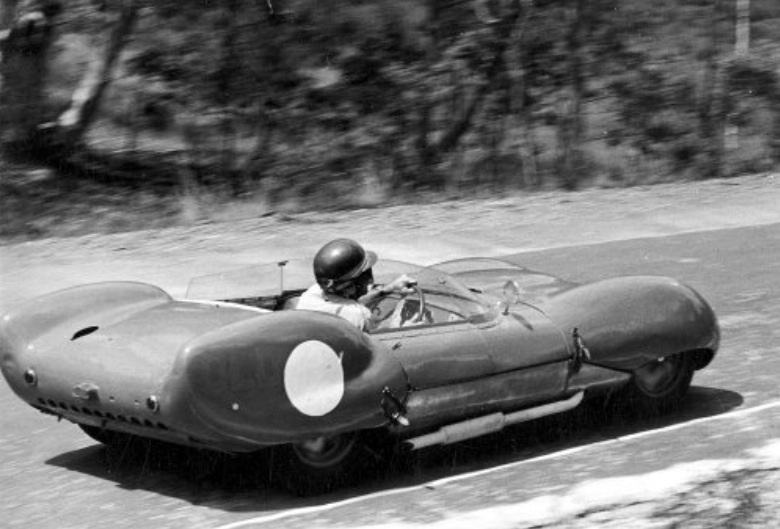 Raced at Easter Bathurst 1950, the 500Kg, 1496cc, Roots-type supercharged, 4 cylinder 130bhp @ 6100 rpm car achieved 122mph through the traps on Conrod Straight in top- 4th gear in its Fiat derived gearbox. Tom bought the car shortly after this meeting and campaigned it in both Australia and New Zealand over the next few years. Among his New Zealand successes were the 1951 NZ Hillclimb Championship, on that tour he also contested circuit races- the Ohakea Trophy and Lady Wigram Trophy in March finishing 4th and taking fastest lap, and DNF at Wigram. NZ ‘heavy metal’ of the day included cars such as Les Moore’s Alfa Tipo B, Ronnie Moore’s Alfa 8C, Frank Shuter’s V8 Spl, Jack Tutton’s C Type, Ron Roycroft’s Jag XK120 and like Australia a swag of MG and Ford V8 powered specials as well as the early Coopers starting to appear. The Maser was period typical in having a channel section chassis, with rigid axle suspension at both ends and semi-elliptic springs front and rear. Sulman was unhappy with the cars handling so modified it by adding 3.5 inches into the front axle, increasing the front track from 3 foot 11.2 inches to about 4 feet 3.5 inches, widening the spring base and inverting the rear shackles. The rear track remained at 3 feet 11.2 inches. When completed he reported the car as extremely predictable and easier to handle. During practice at Parramatta Park in January 1952 he nipped a brake coming into Rotunda Corner, spun, hit the kerb and rolled landing back on the Masers wheels. Damage was limited to a bent stub axle and minor body twisting. He repaired the car and returned to the Land of the Long White Cloud that summer of 1952, racing again at Wigram and Ohakea for 2nd off the front row and 4th. 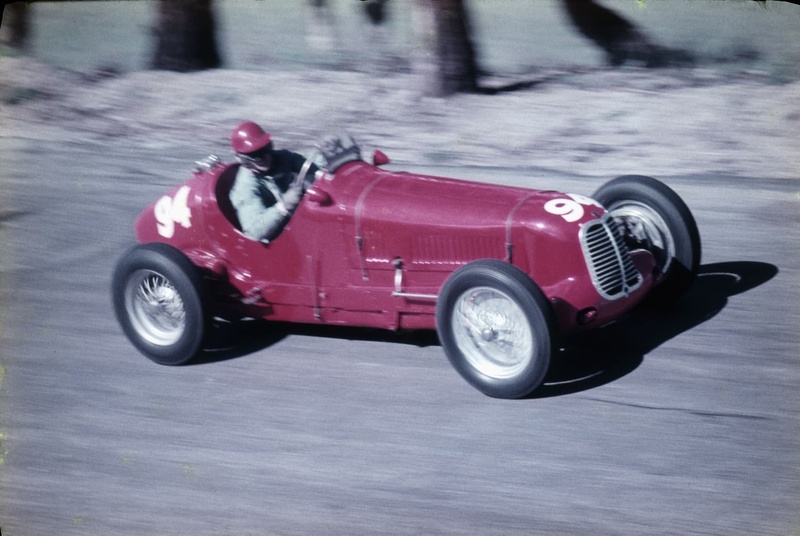 The car was shipped back to Australia in time for the April 1952 AGP at Mount Panorama- finishing 6th in the race won by Doug Whiteford’s Talbot Lago T26C taking the second of his three AGP wins. Probably his best run in the thoroughbred single-seater was at Gnoo Blas, Orange, NSW in April 1953- his haul five race wins. Less happy was the car ‘chucking a rod’ through the block at Mount Druitt, Sydney in 1954. Tom was invited to become a member of ‘The Kangaroo Stable’ which planned a long distance sportscar racing program in Europe in 1955 with three Aston Martin DB3S customer racers. At that point the Maser was sold, it remained in Australia into the mid-sixties but left the country many years ago, living on in historic racing. He acquired DB3S ’103’ new from the Aston, Feltham factory, the car was registered in NSW as ‘OXE-473’ and raced it in England-the Goodwood 9 Hours and at Aintree during the British GP meeting sportscar events, Portugal- the Lisbon GP, France, with the best result a 2-3-4 finish for The Kangaroo Stable behind a Ferrari in the Hyeres 12 Hour in the Provence-Cote d’Azur region of France-Tom was third. His co-driver was none other than Jack Brabham, then in his first year of a long and rather successful racing career in Europe. The Kangaroo Stable’s racing plans were to a large extent scuttled by the ’55 Le Mans disaster and the cancellation of many events in Europe as a consequence that year. Tom returned to Oz, with the Aston his mount for years. 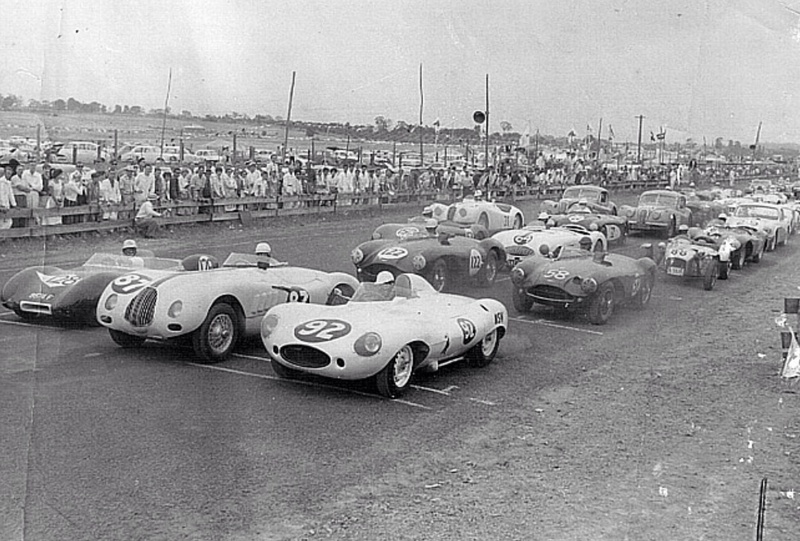 Sportscar racing was especially healthy in Australia at the time with a mix of XKC and XKD Jags, Maser 300S, Aston DB3S, Cooper Jaguar, the Ausca Holden Repco, a swag of Austin Healey 100S and various Climax engined Lotus 11 and 15’s thrilling large crowds. The customer Astons were front third of the field cars. When David McKay’s ex-works DB3S car- DB3S/9 arrived it was the class of the field. Other quicks of the time Bill Pitt’s D Type, Frank Gardner’s C and D Types, Doug Whiteford’s ex-works Maserati 300S and the Derek Jolly and Frank Matich Lotus 15 FPF’s when they appeared later in the decade. Tom’s best results aboard ‘103’ were 2nd , 4th and 4th in the South Pacific Sportscar Championship at Longford in 1958, 1959 and 1960. 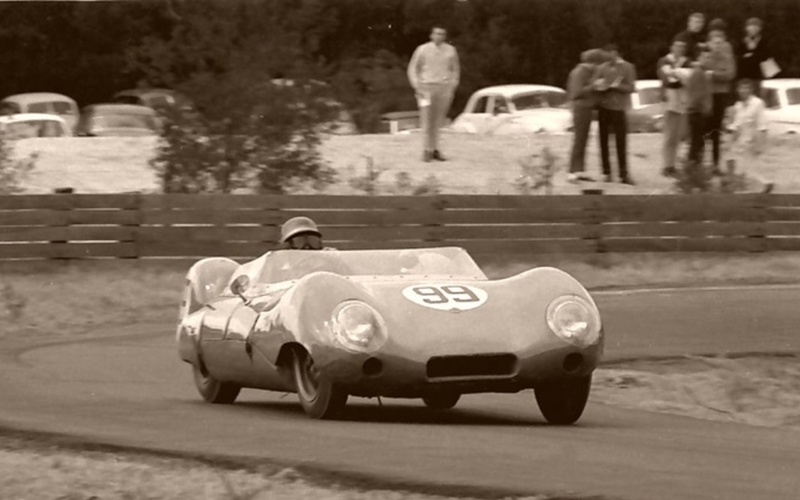 He was 5th in the hotly contested 1960 Australian Tourist Trophy at Longford won by Jolly’s Lotus 15. 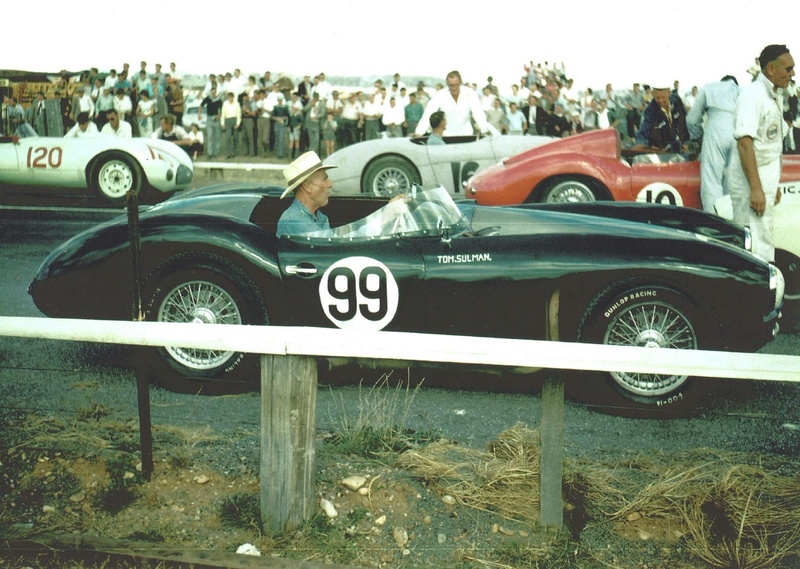 Tom took the car to New Zealand for their summer races in 1956 commencing with the NZ GP held at Ardmore, then Wigram, Dunedin, Ryal Bush and Ohakea, his best results in the two month stay were 6th and 7th at Ryal Bush and Ohakea. At a time the Australian Grand Prix was still a Formula Libre race, with ‘outright’ sportscars regular entrants. Tom the took the Aston on the long trip, 3920 kilometres for you Europeans- you have to be keen!, from Sydney to Western Australia to contest the 1957 race held at Caversham in outer Perth. It was a long way to travel for a DNF, but many cars did not survive another AGP held in scorching hot Australian summer heat. Lex Davison took a famous, and fortunate win in that race co-driven by Bill Patterson. Fortunate in the sense that lap-timing confusion awarded the race to Lex rather than Stan Jones. In addition to Jack Brabham driving the car, the Aston’s provenance was further enhanced when Stirling Moss took the wheel and gave a journalist the ride of his life during several practice laps at the 1961 Warwick Farm opening meeting. In the early 1960’s he bought a locally built Lynx Ford Formula Junior and in 1961 the first of two Lotus 11 Climax’. Chassis ‘343’ was an S2 Le Mans spec car powered by several Coventry Climax FWA engines. The Aston was sold to Ron Thorp, it remained in Australia for some years before it too made its way to the UK. 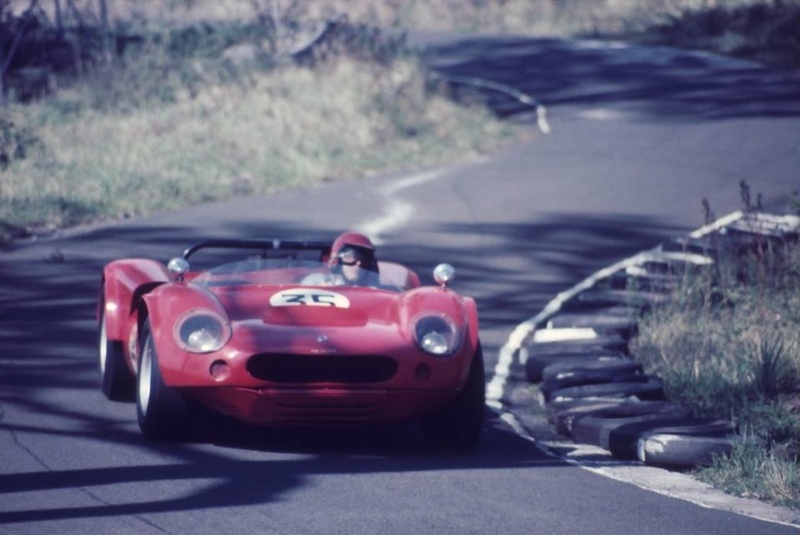 In 1963 he bought his other 11, a Climax FPF engined car, chassis ‘305/552’ which had originally been raced by Ron Flockhart and Roy Salvadori in the UK. This period is confusing for historians as it is not clear which car he raced where- and he raced them everywhere! At sprints, hillclimbs and circuit races. Remember, by 1960, he was 61 and had been racing for the best part of 40 years. Tom’s racing was diverse though, he contested rallies, hillclimbs and sprints as well as circuit racing. His rally/reliability trial experience included the famous, legendary RedeX Round Australia Trials of the 1950’s including the first one in 1953 as a member of the Humber Super Snipe team. He entered touring car races too- as that aspect of the sport grew including the Mount Druitt 24 Hour race and the 1962 Bathurst Six Hour aboard a new-fangled Datsun Bluebird. Some of the cars he raced such as the ex-Alan Hamilton Ford Cobra powered Porsche 904 were very potent devices, he ran this car circa 1969. 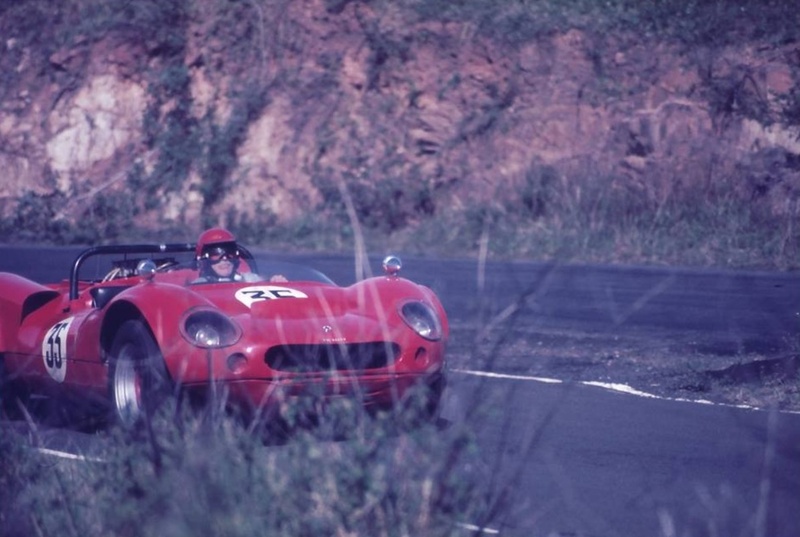 He contested the 1966 Surfers Paradise 12 Hour enduro as co-driver to Ron Thorp who by then was racing a booming AC Cobra, very much a crowd favourite, the duo won their class, that event won outright by Jackie Stewart and Andy Buchanan aboard the famous Scuderia Veloce Ferrari 250LM. In March 1970 Tom loaded the little Lotus 11 ‘343’ onto its trailer in Surry Hills and headed out of Sydney west towards the Bells Line of Road for the 200Km trip to Mount Panorama, goodness knows how many times he would have made that journey? He was off to the Easter Bathurst meeting, at that time there were two race meetings a year at the famous circuit, not just the annual touring car 500 miler. 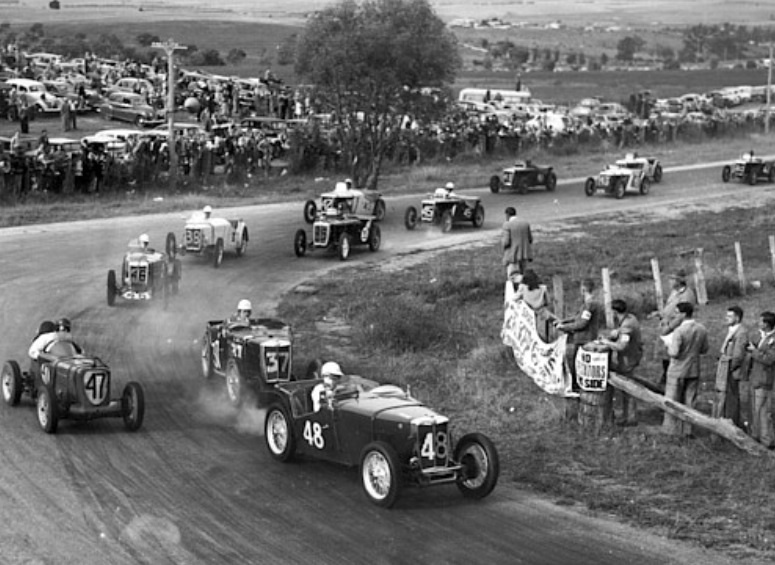 Journalist Barry Lake recounts the events of Sulman’s final drive in the insignificant 6 lap ‘Sir Joseph Banks Trophy’ sportscar scratch race at Mount Panorama. ‘At the Easter Bathurst meeting on 30 March 1970 the quietly spoken Tom, now 70 years old and as keen to race as ever, moved slightly to the right and simultaneously slowed down between the two humps on Conrod Straight. 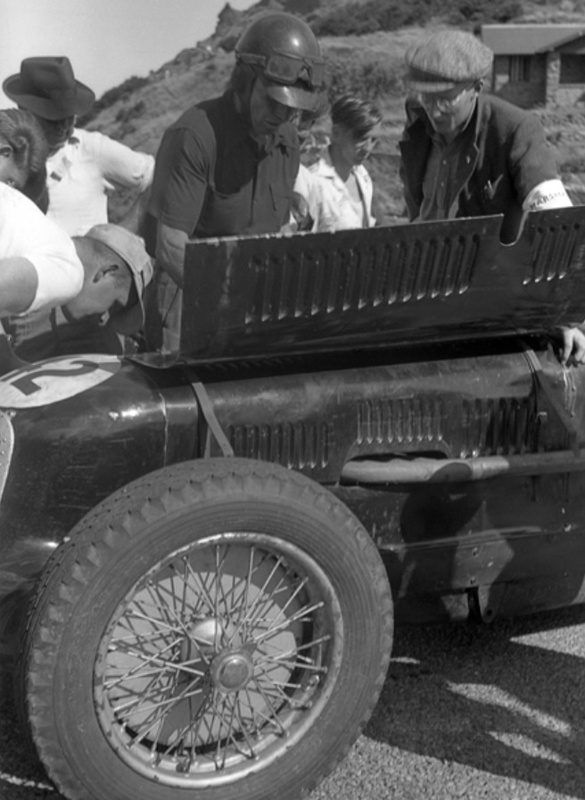 Vincent Evans who was a short distance behind, could not avoid the impact of his left-front mudguard with the right rear bodywork of the Lotus 11 driven by Sulman. The Lotus 11 swerved to the left of the circuit (its inside) into the gravel on the verge and rolled into a locked (farmers) gateway, hitting the gatepost on the drivers side. Sulman’s head hit the post causing his instant death’. ‘Shortly before the accident there had been a ‘Tom Sulman Trophy’ race at Warwick Farm for historic cars to commemorate his very long racing career. At the age of 70, Sulman was one of the oldest racing drivers in activity at the time’ Lake’s tribute concludes. It was a terrible case of being in the wrong place at the wrong time and hitting the fencepost when it could just as easily have been open space. Australian motor racing was rocked by another fatal accident at Bathurst twelve months after the last, Bevan Gibson’s Elfin 400 Repco became airborne on one of Bathurst’s humps at the same meeting a year before. Sulman had lived a good life, a long full one despite its untimely end. He was one of those fellows who put more into the sport than he took out, and loved it to its core. A racer through and through right to the very end.